It wasn’t the first time there was prayer in U.S. Bank Stadium in Minneapolis. It wasn’t even the first time people talked about miracles there. 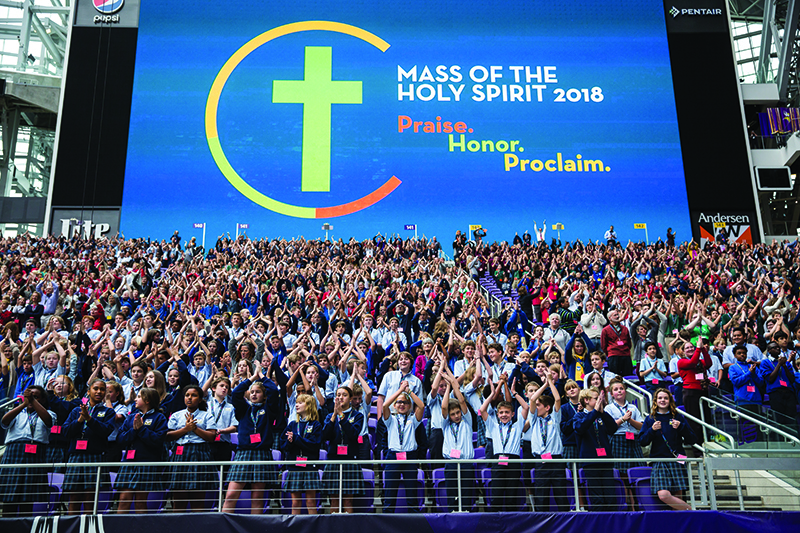 But instead of fans praying for a Vikings’ victory, the stadium was filled with 12,000 Catholic school students joined together to praise the Lord at Mass. The Mass of the Holy Spirit, organized by the Catholic Schools Center of Excellence (CSCOE) to kick off the new school year, brought together students in grades four through eight from the 79 Catholic elementary schools in the Archdiocese of St. Paul & Minneapolis. Archbishop Bernard Hebda celebrated Mass, with Auxiliary Bishop Andrew Cozzens and 70 priests concelebrating. Before Mass began, students were fired up by Catholic rapper Connor Flanagan and Christian rock band Sonar. Matt Birk, Catholic school parent and former Minnesota Viking and Super Bowl champion, also addressed the crowd. Birk was joined by other Catholic athletes, including former Minnesota Wild center Wes Walz, who is the father of five and whose children attend St. Ambrose Catholic School in Woodbury. Archbishop Hebda’s homily encouraged the students to take what they heard back to their schools and practice the virtues that perfect them as Christians. Referencing a comeback win pulled off by the Vikings last January, Archbishop Hebda shared that although many referred to the victory as a miracle, it was actually the result of hard work and preparation. The homily resonated with students like eighth grader Ada Obinwa from St. Alphonsus Catholic School in Brooklyn Center. “I liked the homily and how the Archbishop told us to bring the Holy Spirit back to our school,” she said. Parents who attended were also encouraged by the Mass. Lenny and Brenda Rodriguez, parents of a seventh grader from St. Helena Catholic School in Minneapolis, volunteered at the event and hope to do so again. The presence of the Holy Spirit was evident, from the energetic participation in the music to the reverent worship during Mass. The presence of students from the 79 archdiocesan Catholic schools in one place was a powerful sight. The Knights of Columbus, the Catholic Community Foundation of Minnesota and the Richard M. Schulze Family Foundation sponsored the event. CSCOE held the first Mass of the Holy Spirit in the archdiocese in 2016 at CHS Field in St. Paul.